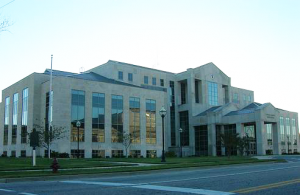 The Alabama Supreme Court eventually overturned the suspended jail sentence the trial court had imposed on Mr. Shelton, ruling that because Argersinger and Scott prohibit an actual jail sentence it makes no difference that the actual moment when it is applied to the defendant is delayed a few months or a few years. And, because the trial court is always prohibited from following through on the suspended jail sentence, then that jail sentence is nothing more than a “hollow threat” – the court is therefore prohibited from even applying jail time as a suspended sentence in the first place. The government of Alabama conceded to the first part of the state court’s logic – that Argersinger and Scott would prohibit a judge from ever following through on a suspended jail sentence unless the right to counsel had been afforded in the first place – but objected to the conclusion that the trial judge was somehow barred under the Constitution from affixing an idle threat. And so the question was brought before the U.S. Supreme Court in the 2002 case, Alabama v. Shelton. If a defendant is not afforded the right to counsel during the trial, can the trial judge still apply a suspended jail sentence as a condition of probation, even if he knows he will never be able to activate it? Or is he prohibited from applying the suspended sentence at all? The U.S. Supreme Court wasn’t satisfied that these were the only options, and asked that both sides consider a third option. 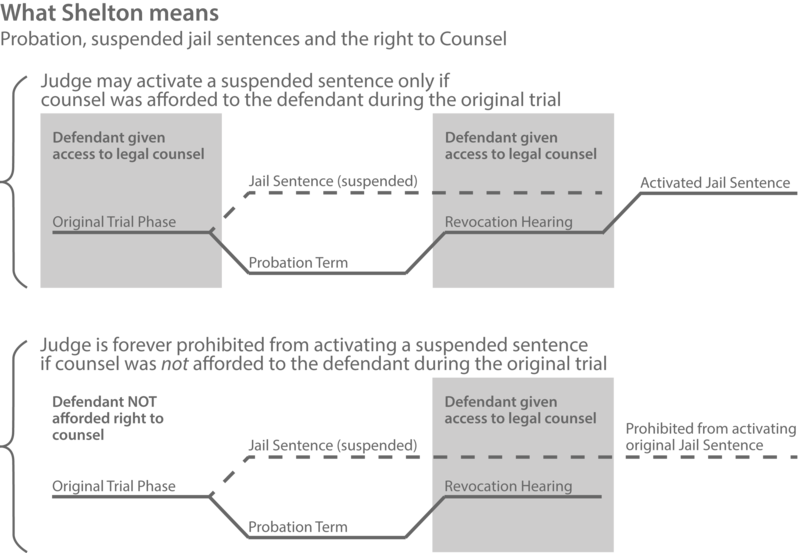 See, many states actually interpreted Argersinger and Scott to mean there was no prohibition against activating the jail sentence, even if counsel hadn’t been afforded during the trial on the original charges, because the right to counsel actually attached in the hearing in which jail time was actually imposed. So, as long as we’re giving you the opportunity to be represented by an attorney during the probation revocation hearing, we’re in compliance with the Constitution. With so many jurisdictions applying the right to counsel in exactly this fashion, including municipal courts operating well off of the radar of state-level policymakers, it was critical that the Supreme Court address this scenario as well. We next explore exactly when during the course of the trial that right is to be made available. A court-appointed lawyer, after all, has to be given time to prepare for the trial, to meet the defendant, and interview witnesses that might have a differing perspective on the evidence being amassed by the prosecution. In order to do all of that, when exactly should the attorney be first appointed to represent the defendant? Technically, the Court took a pass from ruling on this, because what the state of Alabama was proposing had never been done anywhere in the country, including Alabama itself. Alabama was proposing that it still be allowed to impose a suspended sentence of no jail time, and instead be allowed to charge a defendant who fails to comply with the terms of probation (such as failure to pay court costs) with contempt of court. Then in the contempt of court proceeding, where the defendant faces jail time, provide all due process including the right to counsel, under what would be considered a new court proceeding. Nothing of this sort existed anywhere in the country, so the Supreme Court said it would first have to be vetted through the state courts before it would consider it. To date, no such case has been brought before the U.S. Supreme Court.